Monrovia-Liberia - Liberia’s Vice President, Chief Dr. Jewel Howard-Taylor, has identified empowerment as crucial to the effective implementation of Government’s pro-poor agenda for prosperity and Development. The newly unfurled Pro-Poor Agenda for Prosperity and Development, which in its first Pillar, requires the government among other things to empower the people. 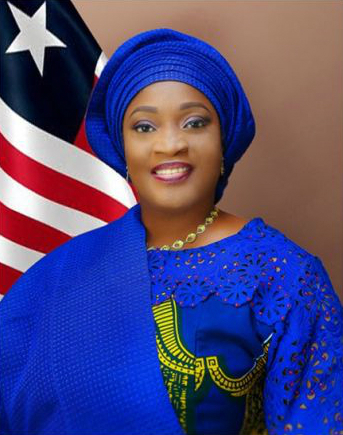 Speaking Monday, November 5, 2018, when she delivered the oratory remarks at the opening of the Overseas Vocational and Skills Training Program held at the Monrovia Vocation Training Institute (MVTC), VP Howard-Taylor expressed her conviction that the youth can be empowered if they are provided the relevant opportunities which they can harness to enable them seize upon available and profitable ventures. She said:”If we are to leapfrog the development drive of this nation, both the public and private sector actors must fetch inspiration from the message of our President, conveyed in his Special Statement recently in Ganta, Nimba County, as he officially launched our new 5-year National Development Plan”. The training project, targeting one hundred youths, is under the Chinese Aid Program to be implemented by the Shan Don Foreign Trade Vocational College in partnership with the Ministry of Youth and Sports. According to VP Howard-Taylor, with all hands on deck both the public and private sectors must encourage the youth to take advantage of skills training, noting that the natural talents of young Liberians can be properly harnessed. She reminded the youths that the opportunities being provided is a unique way of helping them take hold of their future to make it what that are opting to become. The Liberian Vice President averred:”The choice however is yours—to either use it as a stepping stone in your march to a secured future or—God forbid—to miss the opportunities it provides and thus remain in the seemingly endless cycle of poverty and despair. The choice is yours, as only you can make this decision”. 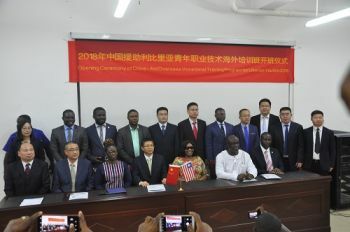 She used the occasion to call on the Chinese Government and partners to continue helping Liberia make functional other TVET institutions across the country. “To our friends and partners, I pray that you will see this as just one step in our journey for the total empowerment of our young people. Though the emphasis here today is on this Institution, I plead with you to keep helping us make functional other TVET institutions across our Nation. To the Ministry of Youth and Sports Family and the faculty and staff of the Monrovia Vocational Training Center, I say bravo and thank you for working in concert to keep the torch of enlightenment burning here, “the VP said in her remarks to the group of MVTC students in Paynesville. Speaking earlier, Chinese Ambassador to Liberia Fu Jijun pledged his Government’s continuous support to the implementation of the Pro-poor Agenda, with emphasis on Pillar One which charges the Government to empowering the people.